Do you want to shift your $ mindset in 14 days? 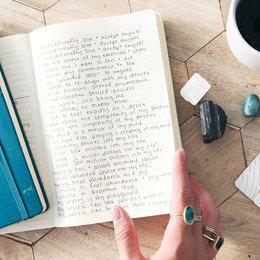 RESET your money mindset for TOTAL ABUNDANCE with this 14-day guided journal. You'll get daily affirmations, journal prompts, and actions for all 14 days. The Program includes, but is not limited, to written content, recorded video and audio content, live and pre-recorded calls, and discussions in Program related forums (collectively, “Materials”). Refunds for the Program are not available. You agree to make timely and full payments to the Company for the Program. You agree that the Company has the right to use your feedback whether in the form of emails, surveys, comments, discussions in Program related forums, coaching calls, or otherwise, for the purposes of marketing or promoting the Program. By purchasing the Program, you accept, agree and understand that you are fully responsible for your progress and results from your participation and that we offer no representations, warranties or guarantees verbally or in writing regarding your future earnings, business profit, marketing performance, audience growth, or results of any kind. The Company does not guarantee that you will get any results using any of our ideas, tools, strategies or recommendations, and nothing in our Program is a promise or guarantee to you of such results. The Terms of Service shall be governed by the laws of the State of New York, and any disputes arising from it must be handled exclusively in the federal and state courts located in County of Kings County, New York. We agree to attempt to resolve any dispute, claim or controversy arising out of or relating to the Terms of Service by mediation. We further agree that their respective good faith participation in mediation is a condition precedent to pursuing any other available legal or equitable remedy, including litigation, arbitration or other dispute resolution procedures. We reserve the right to update our Terms of Service at any time. Such amendments are effective immediately by us posting the new Terms of Service on this Program website at radiantceo.com. Any use of the Program by you after an amendment is made means you accept these amendments. SThe subject headings of the paragraphs of the Terms of Service are included for convenience only and shall not affect the construction or interpretation of any of its provisions.